How does one say Happy Mother’s Day to a mother who went so far beyond the typical realm of motherhood that she had NINE children? As the last of the litter and the runt in the pack, I stood to gain a lot from her incredible patience and selfless work. Constantly in motion, she went about her business and endured the craziness of our household without any frustration. As a mother of only three children, I’m not sure how she accomplished this feat. The noise level alone would be worthy of earplugs. If she wasn’t in the kitchen she was doing laundry or vacuuming or washing floors. And consider, if you will, having six children under the age of eight, and no such thing as disposable diapers? No dishwasher? No microwave? The funny thing is, my siblings and I wonder at her work ethic, but she just shrugs it off, saying it was nothing next to what her mother did. She comes from yet another incredibly strong woman, with thick skin. 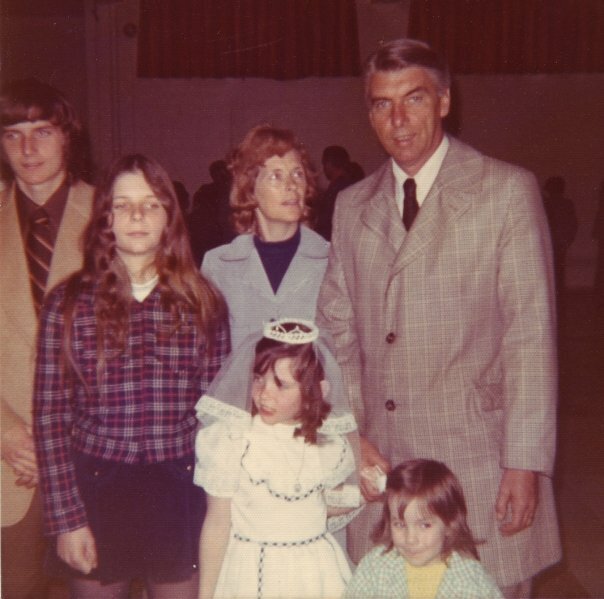 My mother was one of fourteen children. She grew up in a small village in Newfoundland, in a small three bedroom house: one bedroom for her parents, one for the girls and one for the boys. They slept on mattresses made of horsehair, three or four to a bed, and long before luxuries like indoor plumbing. I imagine it to be like the fishing village version of Little House on the Prairie. There was a one room school house and lots of chores for everyone. Surviving the frigid North Atlantic winters that lasted into July was a task in itself. When my mother was thirteen, she was enlisted to help her aunt in Nova Scotia, whose husband had died in the war. The distance between Newfoundland and Nova Scotia, in those days, was not easily traveled. This essentially meant leaving behind all that she knew, to help someone she had never met. Despite how hard this must have been, Mom talks fondly about her Aunt Mary. Childless, she treated my mother like her own, and sent her to nursing school in Halifax when she finished high school. While in training she met my dad, and after graduating got married. Folklore has it that on the eve of her graduation ball, my mother swung from the chandelier at the Lord Nelson hotel in Halifax, fulfilling a dare she had made to her classmates for years. She was a bit wild and full of fun, that woman. 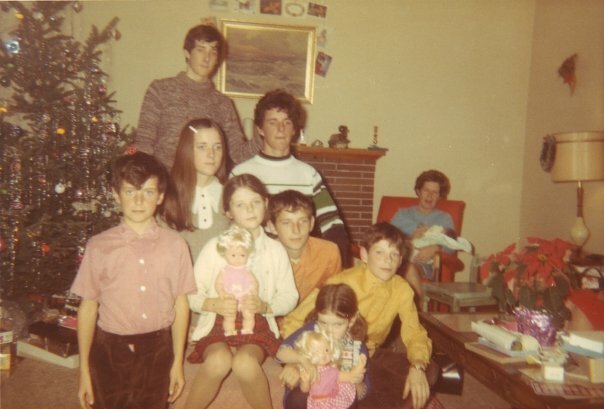 After a couple of years, my oldest brother was born, and the other eight children followed at regular intervals. Her nursing career was interrupted while she surreptitiously cared for her own ward at home. I think about this and I’m impressed all over again. Kate Plus Eight has nothing on my mother, who unquestionably just did it all, without giving any of it a second thought. When I was eleven or twelve my mom went back to work full time as a nurse, and worked her way up to being head nurse, where again her patience and hard work were put to the test. Talk about a life of servitude. My father died of cancer in 1993, a devastating blow for all of us, and somehow my mom has persevered and continues to inspire us all. 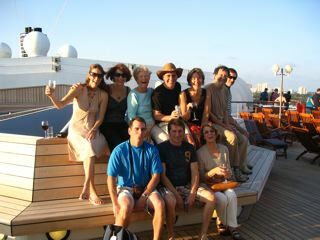 For her eightieth birthday seven of us nine children, plus her brother and his wife, celebrated by going on a Caribbean cruise together. We packed a lifetime of fun into those seven days, our motto was rock it till we dock it. And that we did. Happy Mother’s Day, mom, you continue to be our beacon, our guiding light, our inspiration. You are an amazing person and a woman to be reckoned with. But we’re still not sure how you did it. Wow–so many children! Your mother sounds like an amazing woman. And this is a lovely tribute. I can’t imagine how hard it must have been to leave home at 13! Happy Mothers’ Day to you too, Deanna! I know – many would use leaving home at 13 as an excuse for years of therapy, but I think she regarded it as an opportunity. And a Happy Mother’s Day to you! You’re a pretty great mom yourself, D. And do I ever see the family resemblance in your own children through these images! Thanks Laurie – although sadly I didn’t inherit my mom’s patience! Beautiful Deanna! Happy Mothers Day to an incredible mother in a long line of incredible mothers! Right back at you Nancy – hope you had a great one and that your boys rose to the occasion! Love this. What a sweet post for a seriously admirable lady! Thanks Tori – it’s a tough act to follow, I don’t naturally lend my entire being to motherhood, like my mom did. What a lovely tribute to your mom, Deanna…Maritime women are definitely made of strong stuff! Happy Mother’s Day to you and your mom! Christine Fletcher: Modesty Is Everything to this Triathlete Who Do You Love?